I always like to use something with my foaming cleanser to take off my makeup in the evening- a towelling cloth or muslin to work the cleanser into the skin and wipe off any traces of dirt. 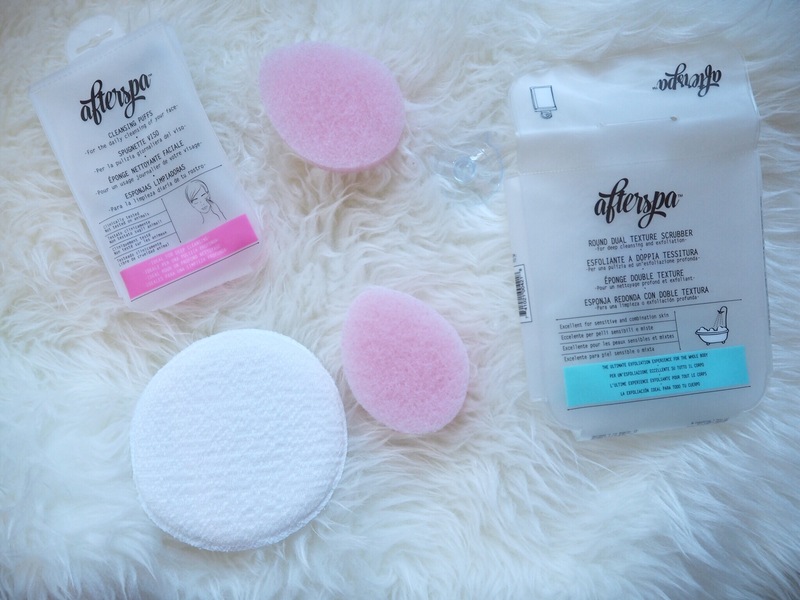 I was sent the Afterspa Cleansing Puffs and the Round Dual Texture Scrubber to try. I also picked up the Afterspa Magic Makeup Remover to complete my Afterspa collection and give Afterspa a really good road test. The packaging is a rubbery silicone pouch, it comes with a suction cup so the packaging can also serve as a storage device for the cleansers in the bathroom. This is a good idea, so that the cleansing devices aren’t just hanging around on the sink getting damp and in the way. 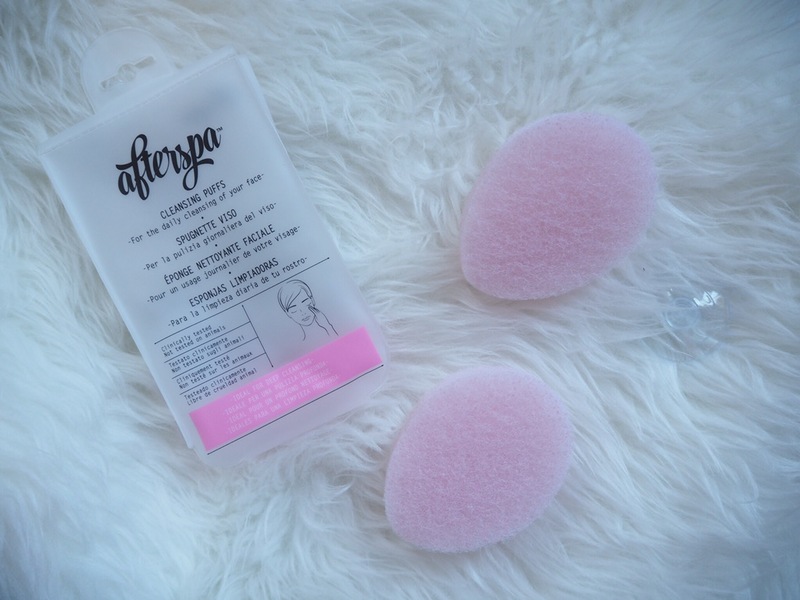 The Afterspa Dual Texture Scrubber is a medium sized round spongy pad covered in a towelling material of two textures, one slightly rougher (more bobbly) than the other. I wouldn’t have named it a scrubber, it doesn’t scrub exactly, it’s softer than that. 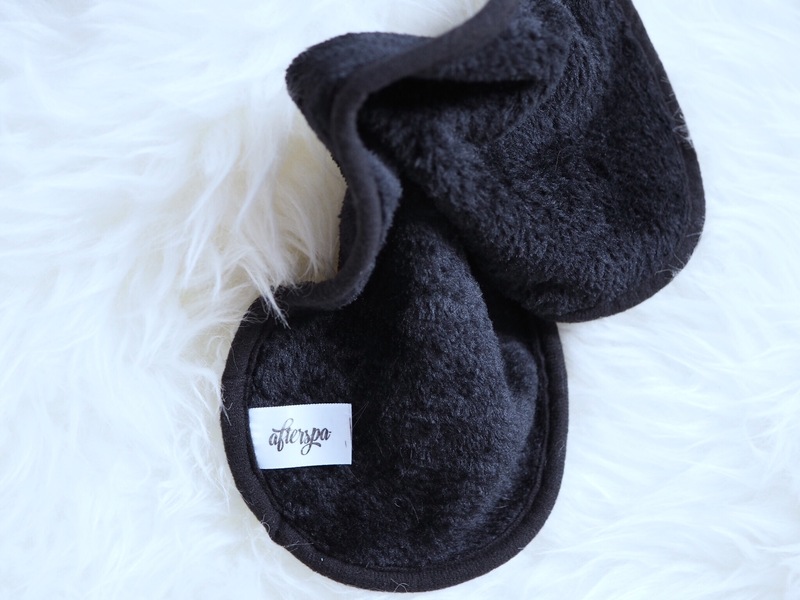 It has an elastic strap that you can flip over when you want to use the other side. I’ve been using the softer side to clean off my makeup and it works really well. The other rougher side can be used for exfoliating the body- the knees and elbows etc. I’ve mainly been using it on the face though (don’t care what my knees look like). It gives a gentle cleanse and it’s easy to use. After every use I cleanse the scrubber with soap and hot water and every few days I disinfect with Dettol. I’ve put the Round Dual Texture Scrubber through the wash and it coped with that just fine. 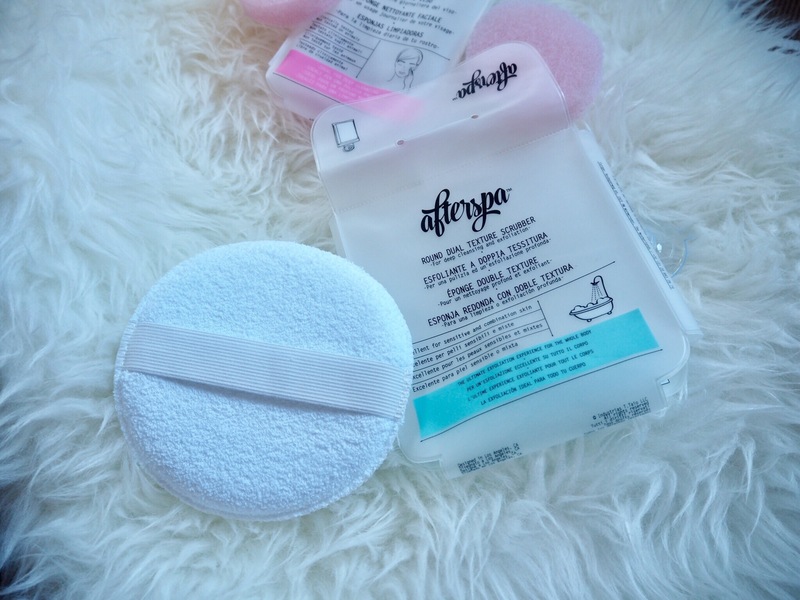 The Afterspa Cleanser puffs are slightly larger than palm sized firm sponges. These are meant for daily deep cleansing of the face. To be honest I didn’t really find these suitable for my face. They are very coarse and I think they would have removed a layer of skin and done some damage. These are probably better suited to exfoliating more robust parts of the body, like the elbows and knees. Again, they come in a handy silicone pouch with a suction cup for storage. The Afterspa Magic Makeup Remover is a very soft velvety polyester cloth. I really like this, it’s my favourite of the three definitely. It’s extremely gentle but somehow removes all traces of dirt and makeup with ease. You machine wash the Magic Makeup Remover after the first use to increase its absorbency and get rid of fibres and after that you’re good to go. It can last up to a thousand washes, so you really get your £6 worth. I’ve got a black one but Afterspa Magic Makeup Remover also comes in hot pink. I like the black (it suits my personality, lol) because it disguises nasty mascara marks. The white Dual Texture Scrubber looked a bit manky after the first use because it’s white. The Afterspa Magic Makeup Remover is not only my favourite out of the selection, but it’s also the best makeup remover/physical cleanser I’ve tried full stop. I think I’ve used most of the things that a person can use to clean their face – muslin cloths (don’t stay warm for long enough), rotating brushes (too harsh), Konkac sponges (Don’t last long), flannels (fine but get manky quickly and look a bit rank). The Magic Makeup Remover has no downside that I can see- it looks nice, it’s effective and feels gentle, it’s very affordable. When this one bites the bullet, which won’t be any time soon, I’ll be buying another.